As the country gets election fever, cash comes out of mattresses and turns into liquor, gifts, and food. But it is not bad for the health of the economy. In the large office of the Chief Election Commissioner, at Nirvachan Sadan in the womb of New Delhi, its occupant Veeravalli Sundaram Sampath is hunched over at a modest, rectangular desk in the centre, several feet away from the heavy, square one next to the wall on the far side that is his work station. High-ranking bureaucrats like to receive visitors either at the big desk, or at the sofa set, around a low table, that is found in all their offices. Sampath, pen in hand, his brow lined in intricate patterns, cuts an unusual figure at the rectangular desk. But what he has to say is more than unusual. He speaks about cash and liquor, of wedding parties without a wedding, and of other forms black money takes during election season. This is the season when India acquires the look of a country much removed from the popular western perceptions of poverty and malnutrition. There is ample money going around as campaigns and rallies gather steam and wads come out of the proverbial mattresses. 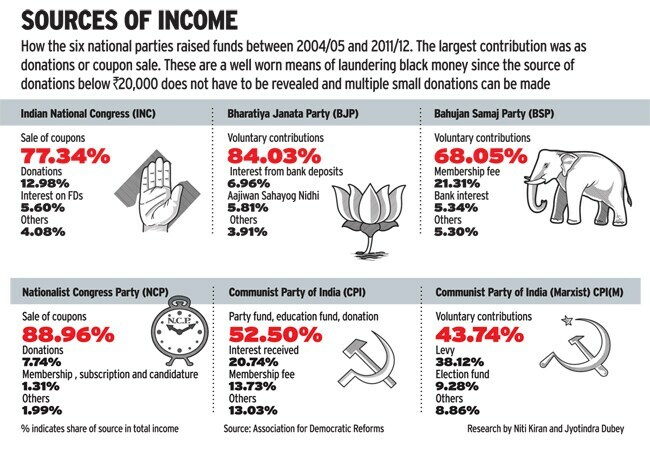 But there are common instances of money actually stashed in gunny bags and stored in houses of political parties' trusted chieftains, who channel it into the hands of "workers" - people who throng the streets on motorcycles, cycles, and rickshaws, and gather at corner tea shops in the evenings in their bid to influence voters. Far away from Sampath, in the village of Vaishali, in the Bihar district of the same name as the village, two brown plastic chairs appear magically under a tree next to a cluster of shops selling tea, snacks and things of everyday use. Sitting in one of those chairs, Mantu Kumar - 40-year-old, of average height, wearing jeans, shirt, a thin moustache, three-day-old stubble, and a well-fed look - looks every bit the man next door. But he transforms once he wraps the cotton scarf on his shoulders around his neck and mounts his 100cc motorcycle. Stopping every now and then to meet people, make arrangements, bark orders, and strike bargains, he becomes Maalik Bhai, which is how everyone in Vaishali village knows him. Here in this little pocket borough, which first gave the world the concept of a republic, Maalik Bhai is known as the man who wins elections for the candidate who pays him for his backing. Unknown to Sampath and Maalik Bhai, their lives have got intertwined as Sampath shows a steely resolve to curb the role of black money this election, bringing together 10 intelligence agencies of the government - among them Directorate of Revenue Intelligence, Financial Intelligence Unit and Coast Guard - in an unprecedented crackdown. Standing in his way is Maalik Bhai and his ilk, small but critical links in the chain that harnesses black money as it comes gushing. Every parliamentary constituency has, on average, eight assembly seats, each assembly has two blocks and 200 to 250 panchayats. There is a Maalik Bhai in every panchayat. They report to those who man the blocks, who in turn report to those in charge of areas contiguous to assembly seats. Each assembly seat is managed by a local strongman who reports directly to a political leader. Niranjan Sahoo, Senior Fellow at Observer Research Foundation, who is coordinating a study series on campaign finance reforms, says black money first came to dominate electoral politics in 1969, when Prime Minister Indira Gandhi banned donations from corporate houses to political parties. "She did not do it with any intent to clean up the system. It was a political decision to curb the growing influence of the Swatantra Party started by C. Rajagopalachari, which was receiving considerable encouragement from the business community." Given the way politics can influence business, and vice versa, their relationship could not be terminated by the ban, it only changed colour. India is already a country with dollops of wealth for which taxes have not been paid. Why, less than three per cent of the population pays direct tax. Arun Kumar, professor at Jawaharlal Nehru University's Centre for Economic Studies and Planning, and the author of the book The Black Economy in India, says the parallel, black economy is at least as big as half the gross domestic product (GDP, which is currently valued at Rs 120 lakh crore, at market price). Read:Ceiling on legitimate election expenditure is too low No wonder there is a fillip to the GDP in the years of Lok Sabha elections, world's biggest political workout. Every currency note that comes out of hiding and is spent, goes into somebody's pocket, adds to his spending power, and gets spent again, often getting taxed at some stage. It comes out of the unaccounted-for, cash economy, which generations of finance ministers have struggled to tame, and gets added to the economy that is accounted-for. "We are all aware that people go to voters with Rs 1,000 notes and bribe them. How do you stop that? Political parties would have disclosed funding details if they were not under pressure to spend the kind of money which is required in a campaign. There is no point in putting blame on them," says Bharatiya Janata Party (BJP) leader and former finance minister Yashwant Sinha . The Election Commission's limit on the amount each candidate can spend - raised to Rs 70 lakh this time - is a tired old joke. "We spend Rs 70 lakh just on cups of tea in election days," boasts a grassroots-level political worker. Sampath's predecessor as CEC, S. Y. Quraishi, says each candidate spent Rs 5 crore to Rs 10 crore in the last Lok Sabha elections, when the limit was Rs 40 lakh, though he qualifies his observation by saying that this is what he hears in private conversations with politicians, there is no actionable evidence of it. the amount, the better the chances of a win. There has always been direct bribing of the voter through cash, gifts, and writing off of debts at grocery stores. Actionable or not, BJP leader Gopinath Munde, according to newspaper reports, said in a public meeting once that he spent Rs 8 crore during the 2009 elections. Congress leader Chaudhary Birender Singh was quoted as saying that people were ready to shell out up to Rs 100 crore to get a Rajya Sabha seat. He later said his point was misreported. JNU's Kumar, as part of his 1998 study on election expenditure, found that some candidates had spent Rs 1.29 crore each, 8.5 times the prevailing Election Commission limit of Rs 15 lakh. "The figure could have only gone up since then. When it was Rs 40 lakh, candidates must be spending at least 10 times that. Now, at Rs 70 lakh, even more," he says. Professor Trilochan Sastry, founder-trustee, Association of Democratic Reforms, an NGO working for electoral reforms, says that at least Rs 2,50,000 crore is spent in a five-year election cycle, out of which almost 80 per cent is black money. Observers say that Rs 50,000 crore of black money will be spent in this Lok Sabha election. Factoring in the ripple effect of this money, which otherwise would have remained unused, and untaxed, experts say the use of black money in elections boosts the GDP growth by half to one percentage point. 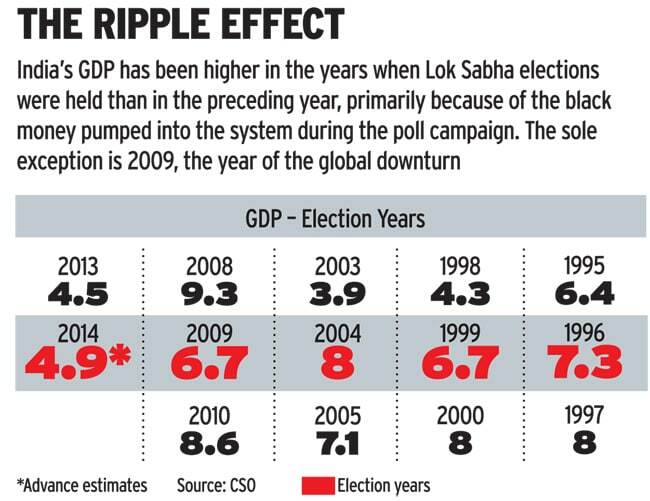 This can be seen in the graphic, The Ripple Effect, on page 48, which shows a higher GDP in every recent election year compared to the year before. 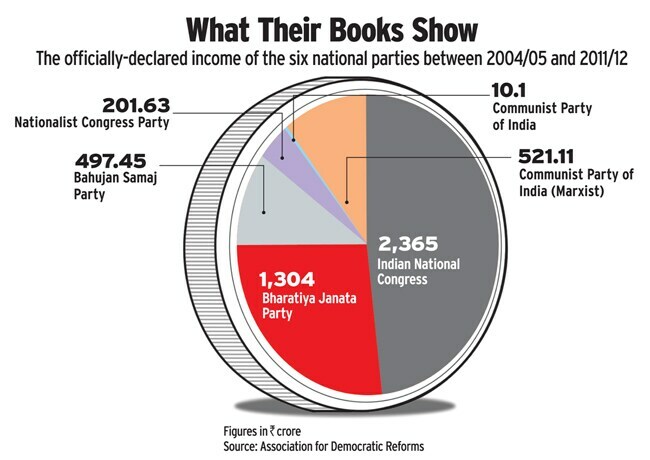 The fillip was quite sharp in 2004, which saw the BJP's high-voltage, but ultimately futile, "India Shining" campaign. The exception was 2009, the year that reeled under a global financial crisis. Rajeev Gowda, Professor, Centre for Public Policy at the Indian Institute of Bangalore, says some people join politics for its wealth-generating potential. "Such candidates may have already amassed wealth in the form of black money and they invest it in politics. Political parties often seek candidates who can finance their own campaigns. Such candidates often have black money generated through industries like mining, real estate, etc, where government regulations are thwarted regularly. Getting elected makes siphoning-off of public resources even easier." But to get elected, they have to rely on people like Maalik bhai. "Political parties do not really have dedicated workers or cadres and have to rely on mercenaries," says N. Gopalaswami, who was the Chief Election Commissioner from 2006 to 2009. According to estimates, 35 to 40 per cent of a party's expenses are on supporting this workforce for 40 to 50 days. Maalik Bhai's support, from panchayat to Lok Sabha polls, is available like any other professional service. He does not go to the highest bidder, but to the one who comes to him first. There is a price for his services, which is not negotiable and varies according to the nature of the election, intensity of the contest, and the number of votes the candidate wants to secure. It can be anywhere between Rs 50,000 and Rs 1.5 lakh, at times with goodies like a motorcycle or a hand pump thrown in. Such is the demand for Maalik Bhai's services that a Lok Sabha contestant himself approached him this time. "Itna bada aadmi khud se phone kiya, saath jurdney ko bola... abhi to help karengee hee na (such a big man called me himself, asked me to join him? I have to support him)," he says, as he takes out tobacco from a little plastic sachet and crushes it on his palm with his thumb. Maalik Bhai begins by identifying the needs of the area. For instance, Brahman Tola in Vaishali village is spread over two square kilometres. It has 100 households, most of them inhabited by daily wage earners. Last election, 15 hand pumps were installed there. Officially, no one knows who paid for them, but they played a big role in persuading Brahman Tola to vote for a certain candidate. Another tool in Maalik Bhai's hand is bhoj, or a community feast. He organises at least five of them in every panchayat he covers. The candidate may or may not attend it, but those who eat at the feast - their number runs into thousands - know who paid for it because his name is whispered into their ear as they say their goodbyes. As the concept of namak (salt)-based loyalty is still strong, the bill for these feasts, Rs 10,000 to Rs 1 lakh, depending on the numbers, is small price for the promise of so many votes. During his tenure as CEC, Quraishi once walked into a wedding feast only to discover no bride, no groom, and no wedding; it was only a way to feed people and hopefully win their votes. Maalik Bhai is paid directly for his support. But operational expenses, such as money for the feasts, and other daily expenses on fuel, mobile phones, meals, cups of tea, paan and cigarettes, comes from the local representative of the candidate and party, a person who can be trusted with a mountain of cash, often stuffed in gunny sacks. The sacks contain mostly wads of Rs 500 notes. As the polling day nears, they stop asking the purpose and simply hand over the amount sought. It is not unusual for the local representative and other workers to boast about the amount they can tap into. The bigger the amount, the better the chances of a win. There has always been direct bribing of the voter through cash, gifts, mobile money transfer, mobile bill payments, and writing off of debts at grocery stores. N. Bhaskara Rao, founder-Chairman of New Delhi-based Centre for Media Studies, points out that at least 20 per cent voters take cash from more than one party. 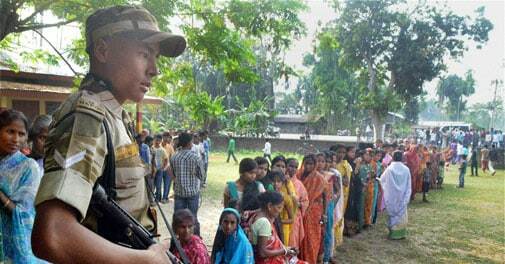 CMS estimates that 31 per cent of voters in Bihar in 2009 election took money to vote; this time, 55 per cent are likely to. Those in charge of assembly areas are entrusted with handling rallies. They work through "mobilisers", who are responsible for bringing in the crowds, through inducement, cajoling, or threat. Each mobiliser gets at least Rs 1,000 for each rally. The overheads include expenditure on food, mostly packets of oily biryani, for the crowd. Often, each member of the crowd also gets Rs 100 as incentive. The team leaders among them, who shout slogans, get Rs 500. Sampath says there is very little one can do when cash is delivered by couriers. In this all-cash economy, there is only one thing that works better: liquor. "Liquor is worse than cash. The influence of liquor hampers the wits of a person. It has its own empire," says CEC Sampath. For him, liquor is also more difficult to track and catch. One hears of trucks loaded with liquor leaving Delhi for Nagaland, but going no further than Uttar Pradesh. The Election Commission is working with the Excise Department in every state to conduct raids against such transporters. But the problem with liquor is that it can be brewed anywhere, in any shack. "It can be brewed locally, at many places, in almost every second village," says Sampath. A vend owner in Delhi says the Election Commission's vigil has made it difficult to move liquor. But, if you cannot move liquor in trucks, there are always milk vans, which do not mind if the liquid inside is dark and fiery, instead of white and soothing. Coupons are distributed in slums and other areas of high voter density. "The pink coupon gets you murga (chicken, often roasted or fried), and the blue one is for liquor," says the vend owner. For areas under surveillance, middlemen distribute currency notes, whose series numbers are given to vends. The denomination of each note is a message. A Rs 10 note will get you a bottle of country liquor, a Rs 100 note foreign liquor, and so on. Vend owners are paid in advance by political managers. In villages, plastic pouches full of liquor are sent in vans and distributed three to seven days before polling, right up to the evening before. Villagers from Raghwapur, also in Vaishali district, say they drink through the night before polling. The village's entire supply of drinking water comes from just two hand pumps. 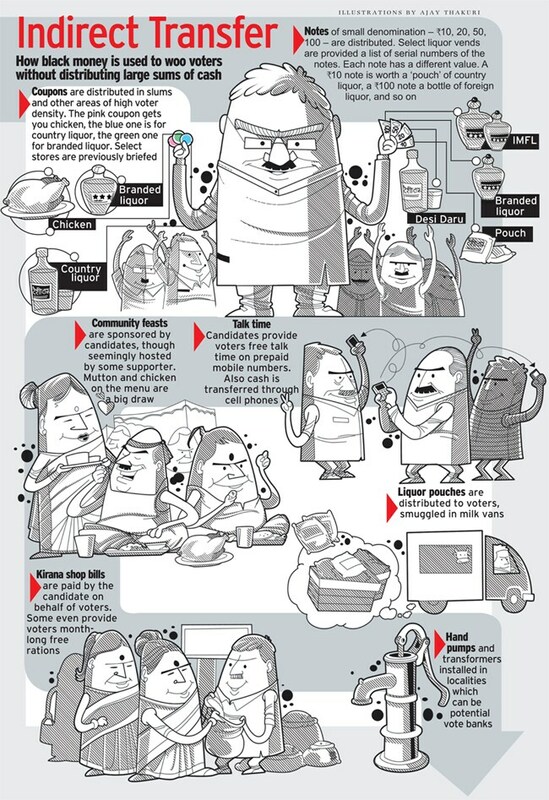 Mobile phones, juicers, other home appliances, and sarees are also forms black money takes to influence voters. Cash or kind, the biggest expenditure is on polling day, on voters and on political managers. Every constituency has 1,500 to 1,800 polling booths. Each booth manager is paid at least Rs 2,500 and there are at least two to each booth. Some observers say that this chain of command of workers from assembly to panchayat level alone can cost Rs 2.5 crore to Rs 15 crore for each candidate. Given that each constituency has at least three serious contestants? you do the math. The Election Commission monitors candidates' expenses for only about three weeks, starting once candidates are official. If an aspirant, certain of getting the ticket to contest, starts spending much earlier, there is no way to calculate his expenses. The distinction between expenditure by a party and by a candidate is another problem area. There is no limit on how much a party spends. In addition, every party has 40 star campaigners, on whom it can spend any amount for campaigning nationally. The lines often get blurred between individual candidate's expenditure and what the party spends. Yogendra Yadav, psephologist-turned Aam Aadmi Party leader, who is contesting from Gurgaon, says it is a legislative problem. "Once you are a star campaigner, you can take as many helicopter rides as you want. With such big holes in the system, no matter how much you tighten them, it remains meaningless." CEC Sampath says black money easily turns into white these days as political parties need not declare details of those who give less than Rs 20,000 and these donations can come in cash. Jagdeep Chhokar, Founder-Trustee of ADR, says the expenditure affidavits of 6,753 candidates in 2009 elections, when the limit was Rs 40 lakh, showed that only four had exceeded the limit. What's more, 6,719 candidates had spent less than Rs 22 lakh. "Why was the limit increased? Either the demand for increasing the limit was unjustified, or the affidavits were not correct." According to old newspaper reports, former Prime Minister Atal Bihari Vajpayee once testified to a parliamentary committee that "every legislator starts his career with the lie of false election return he files". Once again assuming at least three serious candidates in each of the 543 parliamentary constituencies, and the unending cycles of electioneering for Rajya Sabha, state assemblies and councils, municipal corporations, block and panchayat elections, that is a lot of lies. And a lot of money. It is not bad for the economy, but is it good for democracy? You do the math.